Damaged rims is a complete nightmare, not only if it's an eyesore but unbalanced wheels could lead to more problems and even crashes. Fixing them is a painful expense and could cost an arm and leg. Here's how to do-it-yourself! 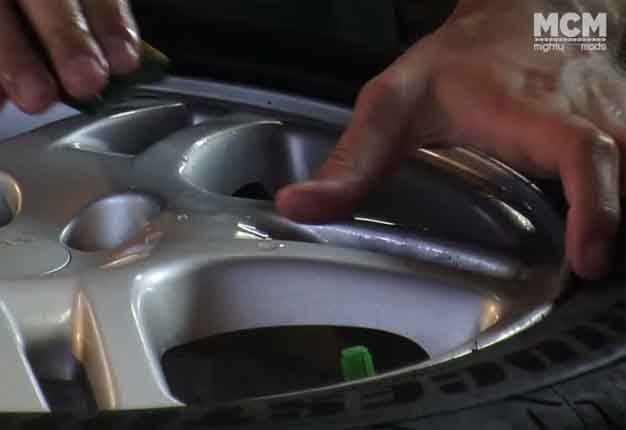 However, dudes Marty and Moog who have an online show called Mighty Car Mods, offer some really easy helpful tips to fix cosmetic damage to your own rims with the most basic equipment. Has your mom or wife bashed your rims into a kerb? Or have you misjudged that parking spot and got too close leaving a deep gash? Here’s an easy way to take away some of the pain after hearing that awful sound. And since we live in South Africa where potholes on the roads are like your neighbour’s cats and all its kittens in your garden, everyone has a scratched or botched rim. You will need a cloth, some wax and grease remover, sandpaper - lots of it, body filler, prima filler, wheel coating spray – preferably the same colour as the wheels. The things they don't mention is masking tape, hardener and some makeshift tools to mix materials. You''ll also need a lot of time and no tender fingers. The problem is the cost of all these materials could just amount to taking your rim to a mag repair shop and having the professionals fix it for the same price. Wheelworx owner Zaki Hendricks said: "A damaged rim could cost anything from R350 to R1200, depending how bad it's bashed and if its buckled or needs extra paint." This also isn’t an easy task, and definitely not as easy-peasy as what these two guys make it out to be. If you don’t have any patience, and the job is rushed, your wheels might just look worse than what it originally was. But, if you’re the type who likes to do-it-yourself, it can be quite enjoyable, even therapeutic and rewarding once you see the final product. Or perhaps you’re looking for a hobby or trying to find a way to keep your boyfriend/husband occupied at home? Many people have a set of spare rims lying about and if fixed up could be sold online or privately and bring in some extra cash. Wheels24 recommends that if a rim is buckled, or severely damaged, that it should rather be sent to a professional workshop because there’s no way to balance it at home. Buckled rims could affect your tyres and eventually even your suspension if not seen to. Watch the video anyway and pick up a few tips to make your sight-for-sore-eyes rims look as good as new. Are your tyres and rims in up to standard? We suggest you read the 12 tips on keeping your tyres rolling. It's good to have piece of mind. Hearing your rim scrape against the curb or driving through a big pothole makes anyone cringe. So is the price of having your rims repaired. Here's how to do-it-yourself!